In the central part of Honshu where the Japan Alps runs from north to south, you can enjoy autumnal scenery everywhere with the magnificent mountain landscape in the background. In the northern Hokuriku heavy snowfall area, many beech virgin forests and birch forests are found, and in the south, Mt. 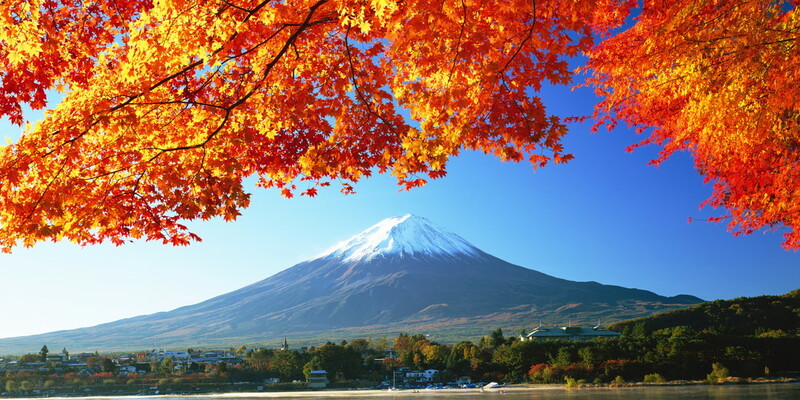 Fuji and Fuji Five Lakes show a spectacular view of autumn representing Japan. You can feel the depths of Japan's mother nature for a variety of autumn leaves landscapes with different tastes. Kamikochi in the valley of 1500 m above the sea level in the southern part of the North Alps. It is a mountain resort that represents Japan, where you can enjoy autumnal leaves by walking on the promenade while private cars aren’t allowed to protect nature. From the Kappa bridge crossing the Azusa River of the light blue clear stream, you can enjoy the magnificent mountain landscape of Hotaka mountain range in the upper stream and Mt.Yakedake in the lower stream. 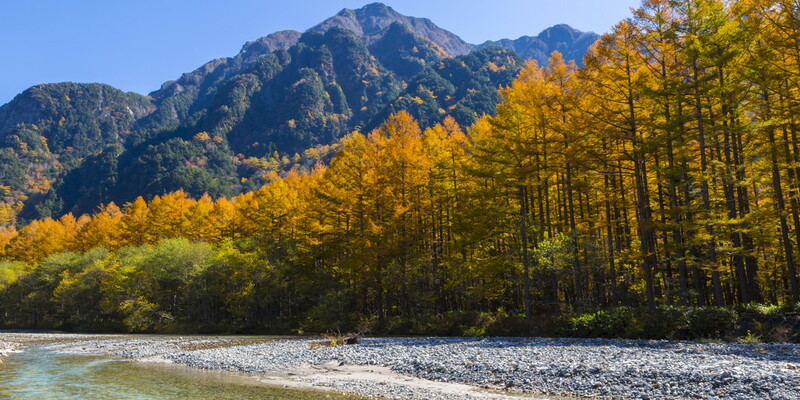 In autumn, Kamikochi is covered with yellow leaves of larch, birch and　Ulmus davidiana, while the delicate　red color of Chosenia bracteosa along the Azusa River and the red color of Rengetsutsuji and Kohakuuchiwa kaede seen in the forest and wetlands give accents. There are also many evergreen coniferous trees of Abies homolepis, and the contrast between yellow leaves and red / green shines. The magnificent view of the mountains of the Northern Alps and the incredible beauty of the scenery by the waterside of the Azusa river, Taisho Pond and Myojin Pond bring out the golden colored autumn leaves. One of the Fuji Five Lakes scattered in the northern foot of Mt. Fuji, Lake Kawaguchi. In autumn, a lot of people visit the autumn leaves spot to enjoy both Mt. Fuji and autumn leaves by the lakeside. The view points are concentrated on the north shore where Mt. Fuji can be seen across the lake. The ""Momiji corridor"" on Kawaguchiko Museum of Art Street forms a tunnel where about 60 old trees of Momiji are dyed red. 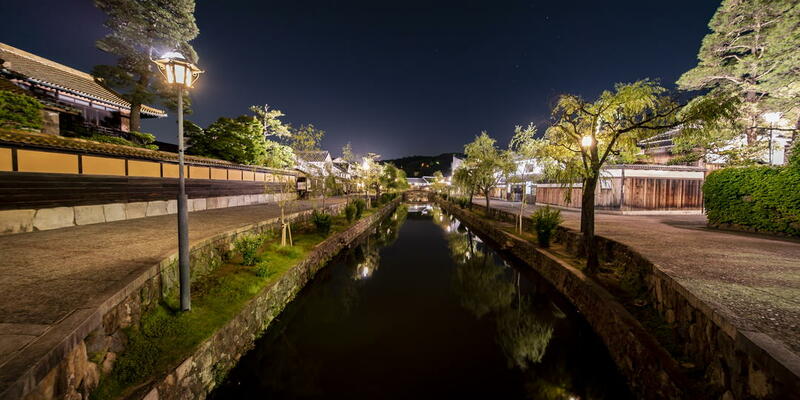 This corridor is the main venue of the ""Fuji Kawaguchiko Lake Autumn Leaves Festival"" held in November, and you can enjoy a fantastic light up during the period. The ""Momiji tunnel"" along the Kohoku View Line is covered with tremendous Momiji trees and you can see a magnificent view of Mt. Fuji floating beneath it. In addition, it is also interesting to visit the colored leaves spot on the north shore, such as the vicinity of ""Rusugaiwa Rock"" where a big Momiji tree is protruding to the road, ""Sunnide parking"" near Nagasaki Park, and the Lake Kawaguchi Circular Hall. Also, on the south shore of Lake Kawaguchi, Momiji and ginkgo in Myohoji Temple are vividly colored, and in the calm atmosphere of the old temple, you can enjoy the autumn colored leaves which are different from the north shore. An excursion garden of Kenrokuen,where a variety of trees are planted around the vast Kasumigaike pond, and the teahouses and stone lanterns give off Japanese atmosphere. 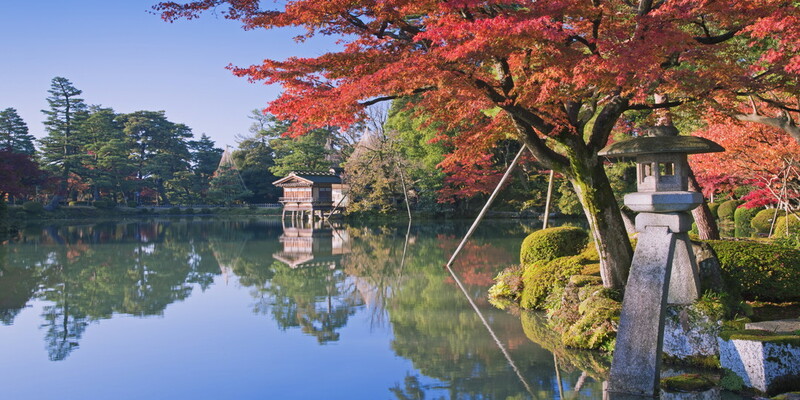 The successive Kaga lords completed the great garden over a long period of time, which shows the harmonious autumn leaves beauty such as maple, Japanese zelkova, cherry trees and Enkianthus perulatus in autumn. There are about 340 maple · Momiji species, about 420 cherry trees and about 60 Japanese zelkova in the park, where colored autumn leaves are glowing with pine green. Autumn leaves are reflected beautifully on the surface of the pond, and there is a view point in front of the stone lantern by the pond. In November, snow hanging work for pine trees begins as part of the winter tradition, and you can enjoy the elegant scenery interwoven by neat snow hanging pine trees and autumn leaves trees. After the middle of November, light up in the garden begins and the taste of autumn leaves further deepens. In the middle of Kurobe River, Kurobe gorge forms the V-shaped valley which is said to be the deepest in Japan. The rugged topography refusing people to enter creates the strong atmosphere of the unexplored area in the gorge. Along the gorge, the trolley train of the Kurobe Gorge Railway runs slowly from the Unazuki station in Unazuki Onsen town to the last stop, Keyakidaira station. From the train window, there is breathtakingly magnificent scenery of autumnal leaves spreading with a mixture of red colors, such as Yamamomiji, rowan, Japanese zelkova, Hauchiwakaede, and yellow colors, such as Itayakaede, beech, and Mizuki. Unique hot springs are dotted along the railway line, and at the Kanetsuri station on the way, it is also fun to see the shining blue clear stream and the autumn leaves on the mountains while soaking in the foot bath which naturally gushes out to the riverside. 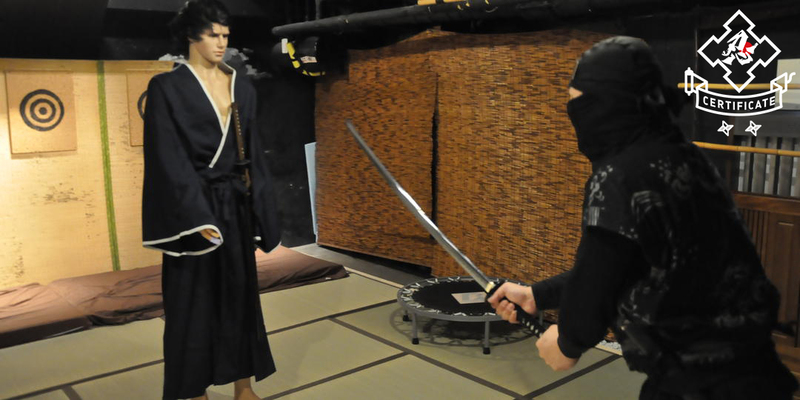 There are scenic spots such as Hitokui Iwa(People-eating Craig) and Sarutobikyo at the last stop,　Keyakidaira, and you can experience untouched nature while walking through the promenade wrapped in autumn leaves. Tateyama Kurobe Alpine Route through which you cross the Northern Alps of the mountains exceeding 2000 m in altitude by six vehicles such as cable cars and trolley buses. On the observation deck of Kurobe Dam on that route, you can overlook the large panorama of the biggest arched dam in Japan and Kurobe lake in emerald green against the Tateyama mountain range. 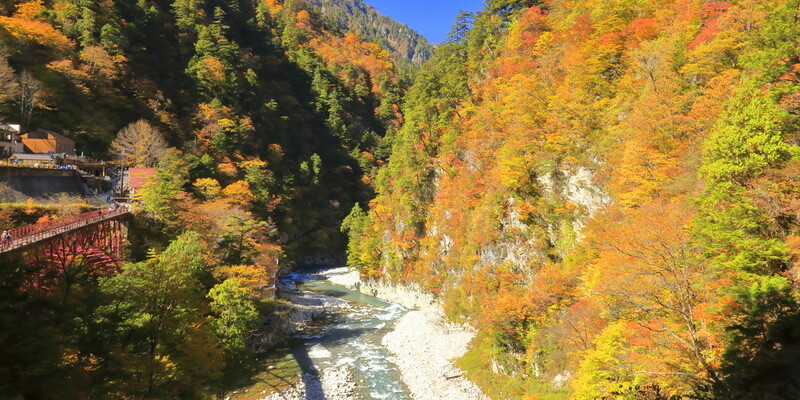 The surrounding of Kurobe Dam in the altitude of 1,470 m will be a magnificent view of the ""three-stage autumn leaves"" of colored leaves gradually descending from the top of Mt.Tateyama. On the promenade maintained on the banks of Kurobe Lake, you can feel free to touch with the nature of the Northern Alps, autumn scenery with colors of red and yellow of rowan, birch and Minekaede are magnificent when you look out from the pleasure boat ""Garbe"" on the lake. 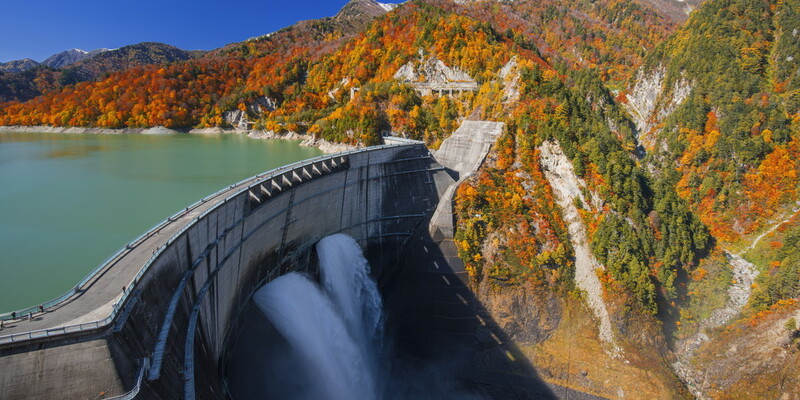 From the observation deck, you can also overlook the impressive full-scale scenery of Kurobe Dam discharging 10 tons of water per second. 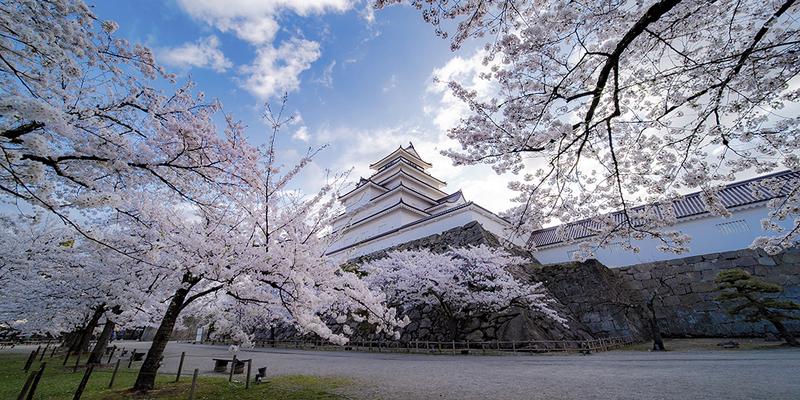 A scenic spot designated as the country's special place of scenic beauty in the upper Arakawa of the tributary of Fujikawa in the northern part of the Kofu basin. 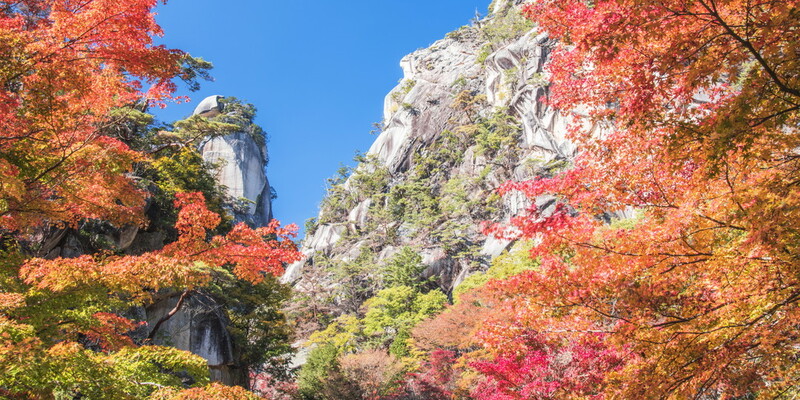 Odd rocks are seen everywhere in the valley, and white surface of granite rocks and red and yellow autumn leaves of maple and cherry trees show distinctive contrast. Nagatoro bridge which stands as a gateway to the valley, Kakuenbo of the symbol of Shosenkyo standing upright with the height of approximately 180 m, Senga Fall of 30 m above the head, Tenkorin which resonates with the pom-pom sound from the ground when you stamp on your foot. Those are red leaves spots representing the valley dotted along the boardwalk. During the colored leaves season, the Senga Fall is lighted up and you can enjoy the exquisite taste of the night fall wrapped in light. Rakan Temple near Tenkorin also has a taste, and the scenery of waterfalls and autumn leaves is splendid in the Itajiki Valley in the upper stream. 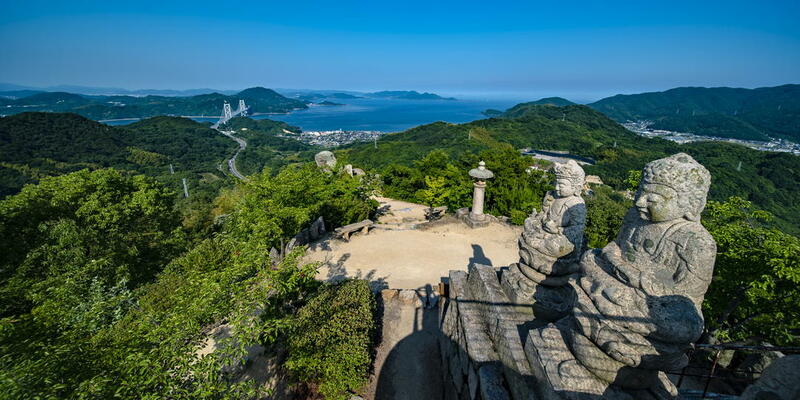 If you climb up to the observatory deck with the Shosenkyo Ropeway, you can see the magnificent view of Mt. Fuji beyond the valley which is dyed in brocade. 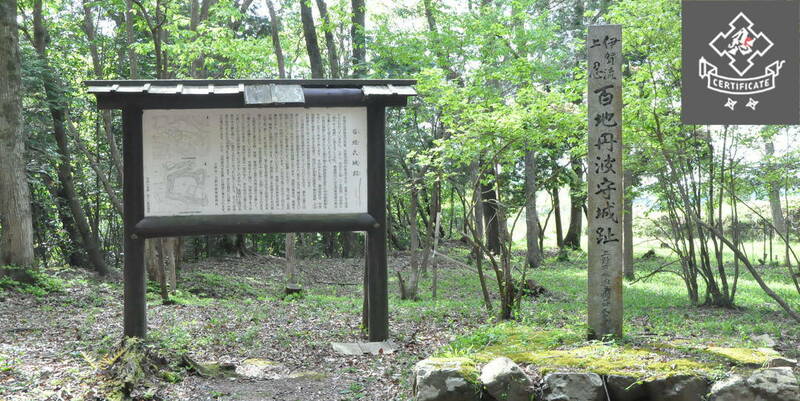 Yahiko Park leading to Yahiko Station is a vast park of about 40,000 tsubo, built to commemorate the reconstruction of the Yahiko Shrine and the opening of the railroad. In the park, waterfalls, mountain streams, high grounds are scattered in harmony, and you can take a walk leisurely while being familiar with nature. 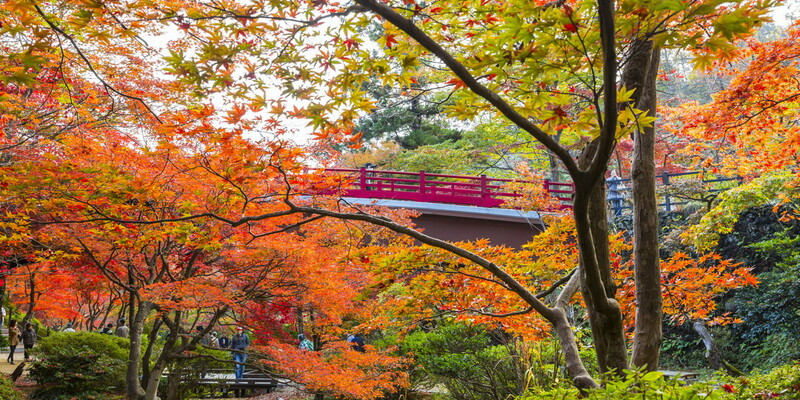 The red Kangetsu bridge over the ""Momijidani"" is made by reproducing the old wooden bridge and in autumn, Momiji spreads as if it overhangs, and shows the scenery like a picture scroll. Colorful maples overlap each other around the bridge, and even if you look down from the bridge or look up from the bottom of the bridge, it is a magnificent view. During the autumn leaves season, it is lighted up and wrapped in a mysterious atmosphere that is different from daytime.